Minnow 2.0 is a real-time display enabled logger from Senonics. Minnow 2.0 can be used for transport applications. Suppose for example you would like to transport some delicate or fragile cargo from one location to another. 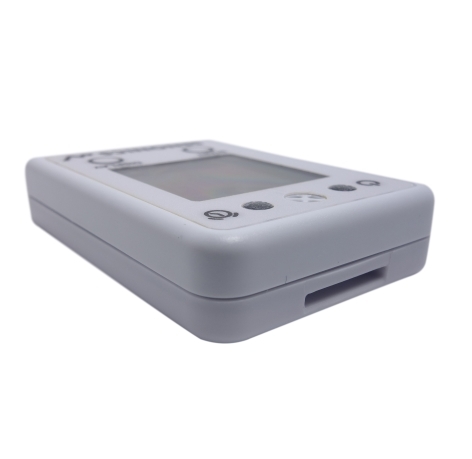 By attachment of a Minnow 2.0 logger one can record temperature and humidity conditions during the journey. At the destination you can then extract the logged data using a very simple PC application and see graphically or in raw data format the changes in environment over time. With its built in display, Minnow 2.0 can equally be used in-situ - for example in pharmaceutical storage. Minnow 2.0 offers accurate and repeatable logging for temperature and relative humidity. Temperature is measured to an accuracy of +/-0.17C over the range +5C to +60C and +/-0.9C over the full range -25C to +80C. Relative humidity is measured to an accuracy of +/-2.0% over 20% to 80% humidity range and +/-5.0% over 0% to 100%. 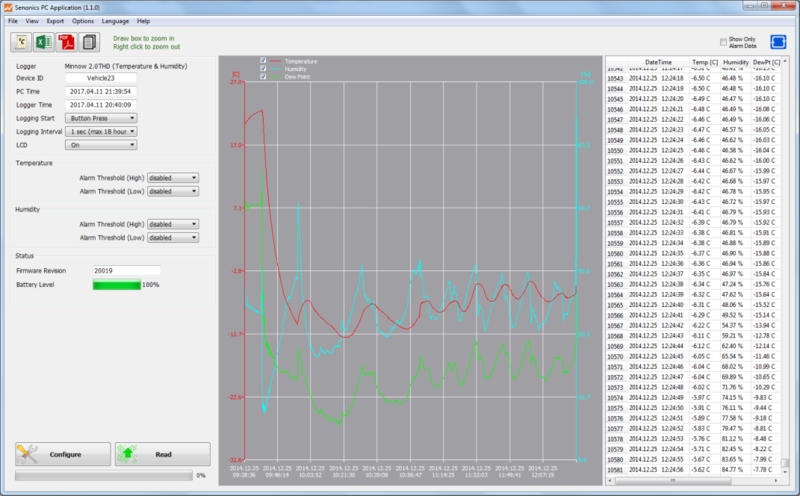 Both temperature and relative humidity are logged at a user configurable logging rate which can be set in a PC application program. 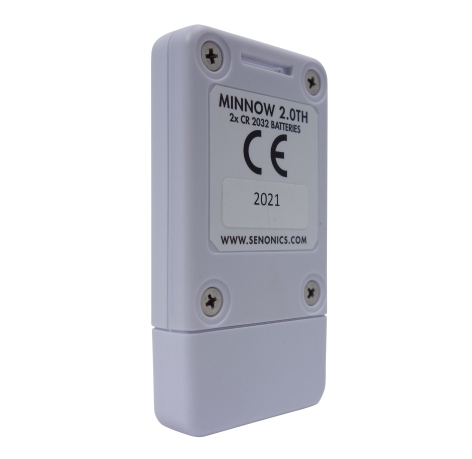 Minnow 2.0 offers an optional NIST traceable single point calibration. Once calibrated Minnow 2.0 is accurate to +/-0.07C within +/-20C of the calibration point. 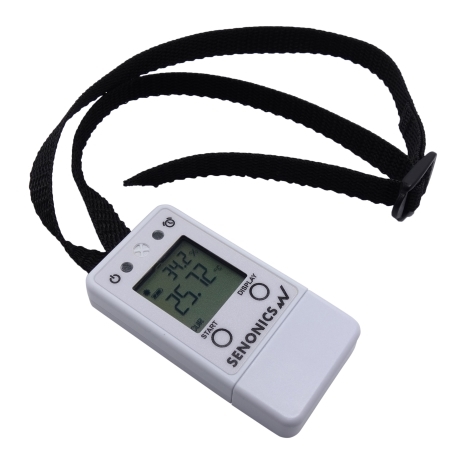 Minnow 2.0 has a clear LCD display with wide viewing angle, capable of showing temperature with a resolution of 0.01C and relative humidity with a resolution of 0.1%. Use of the display button on the logger will cycle through current, maximum, minimum and average logged values. When you would like to ensure environmental conditions are kept within particular limits, one can also set operating ranges above or below which light indicators will be activated so that the user can become aware that the environment has gone outside allowed limits. The alarms are also visible on the display. 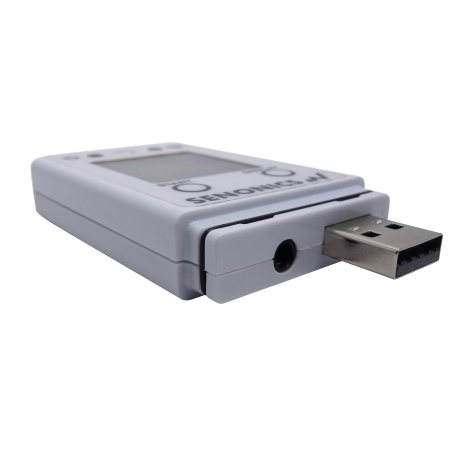 The Minnow 2.0 logger is equipped with the largest logging memory when compared with other portable logging devices currently available. Minnow 2.0 has provision for 65000 storage items each of which is a time-stamped recording of temperature and humidity. Minnow 2.0 has been designed with special care to avoid water or dust from entering the logger. Both Minnow 2.0T (temperature only version) and Minnow 2.0TH (temperature and humidity version) are rated IP-65. Minnow 2.0 can be used with external sensor probes. 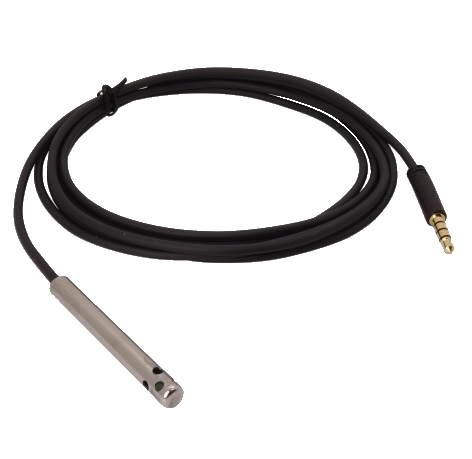 Probes can be of temperature only or temperature and humidity types. It is possible to mix and match T/TH sensors and loggers. The Minnow 2.0 logger comes with a very easy to use PC application. The application is used for configuration of the logger, extraction of logger data, graphically viewing of logging data, spread sheet analysis of logging data and saving of logging data to file (typically in comma separated value CSV file format) for third party applications such as Microsoft Excel. The graphical user interface is completely intuitive in terms of configuring new devices and extracting logging data from a field device. When the user has multiple devices requiring the same setup then one can preload the application with a logger setup from a saved configuration file to help expedite the process and ensure all loggers get setup identically. The application does not require any driver installations to connect to your logging device. Just download the program from our home page, run it and then plug in you device. As simple as that! Currently the PC application is available for Windows XP, Vista, Windows 7, Windows 8 and Windows 10. It is also supported on Mac. Minnow 2.0 runs from two CR2032 coin cell batteries available from supermarkets or online battery stores over the internet. The logger can log temperature and relative humidity for up to 2 years. 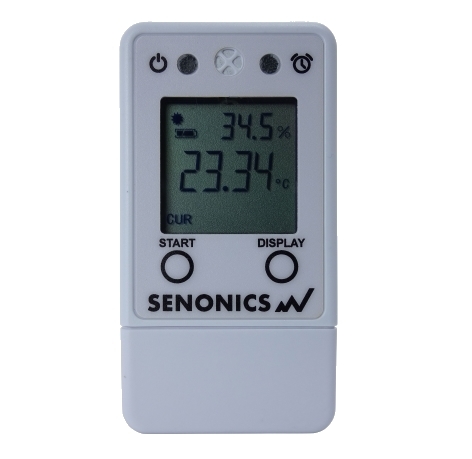 Senonics logger products are developed by world class engineering teams situated in Denmark and United States. Our engineers are very proud of the Minnow logger range which is marked by their special design philosophy of ensuring both a feature rich product but simple for the end user. Our designers have a well-deserved reputation for high quality product design ensuring that your logging device will both last the years and exceed your logging requirements! © Senonics LLC: web template by Templated.